what tapping an album, a track and that ">" will do? i don't think i will ever need it but for the sake of clarity: will we be able to create our own structures based on title formatting? > adds the item to playlist, tapping plays it (if a track) or goes into it if folder / album. Not sure at this stage what level of customizing we will offer on formatting. I like the layout. A + sign would work better than >, as > already has meaning in ios and android. Congratulations, first of all, on goals reached so far! Is it likely that elements of the UI will be replaceable or hideable - for instance replacing 'ratings' with something else, or hiding it altogether? And might there be options when adding tracks or albums to a playlist - add next, add last, add shuffled and so on? EDIT: Apologies, I see my second question is more or less answered in the Functionality Proposal thread. Last edited by Ellul; September 20th, 2014 at 07:01 AM. 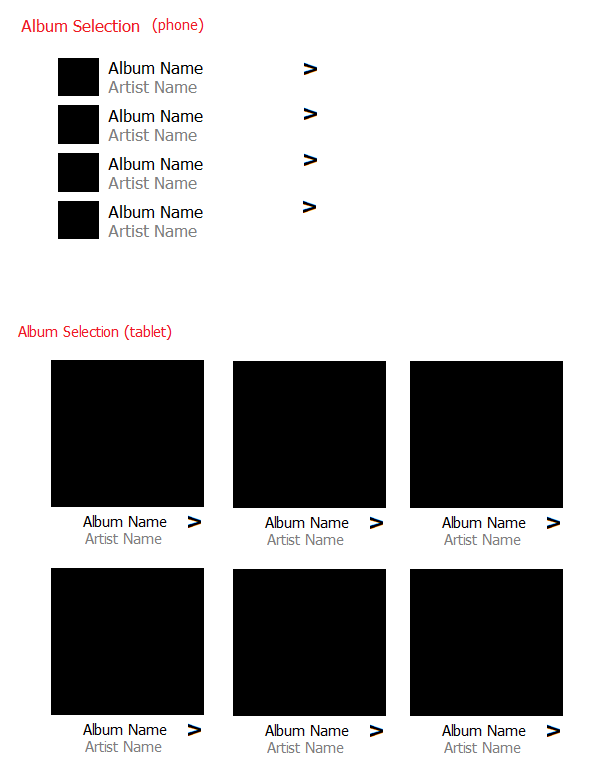 I already wrote in phone design functionality proposal that "there are three basic entities of a library that each user could and would expect: album artist, album and tracks". Never mind what comes before in the browse hierarchy (genre, date, ...) these three entities would be always of interest. Therefore at the last level of hierarchy it would be reasonable to swipe through these entities. 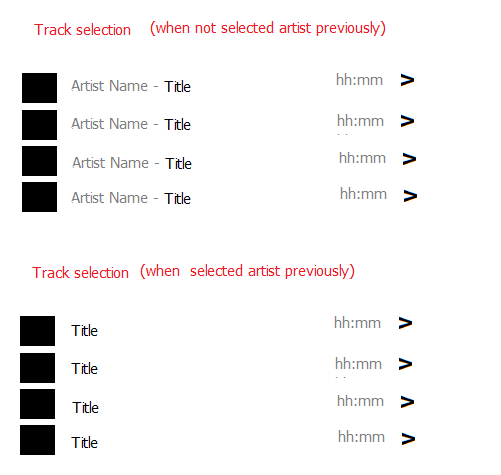 If now all eventualities were covered (multidisc albums, presence of album artist tag or iTunes compilation tag, presence of track artist and similar stuff) then the best display could be offered automagically and without the need for user to write complex title formatting expressions. To sum up: you would have 1. album artist -> album -> track, 2. album -> track and 3. track at the end of each view. And it seems to me that the browse arrangement proposal is able to match all possibilities. In regard to uper levels of browse hierarchy: also here title formatting could be avoided if for creation of views some fields (genre, style, date, publisher, ...) and some expressions (decade, first letter of artist, ...) are offered. Only that and without the need of title formatting would be enough to offer much more than any other mobile player. I so far don't know neither one player that would let you create custom views, not to mention creation by title formatting. It is probably a matter of which point of view you have, but i can imagine that for the biggest part of the potential userbase the absence of title formatting would be the better experience. Plus signs might make some more sense, but it's a minor point. Was sort of hoping some kind of augmented folder tree would make it in. It's the best fallback, imho. "I already wrote in phone design functionality proposal that "there are three basic entities of a library that each user could and would expect: album artist, album and tracks". Never mind what comes before in the browse hierarchy (genre, date, ...) these three entities would be always of interest. Therefore at the last level of hierarchy it would be reasonable to swipe through these entities. " It makes sense to group thouse, but I'm not sure what you mean by 'swipe between them'. Last edited by bilditup1; September 23rd, 2014 at 02:09 PM. Let's guess: you don't use a windows phone device? When you browse you tap on an entry and you go one level deeper. In contrary swiping means: you swipe through the screen from left to right or right to left - that brings you to another view of the same level. 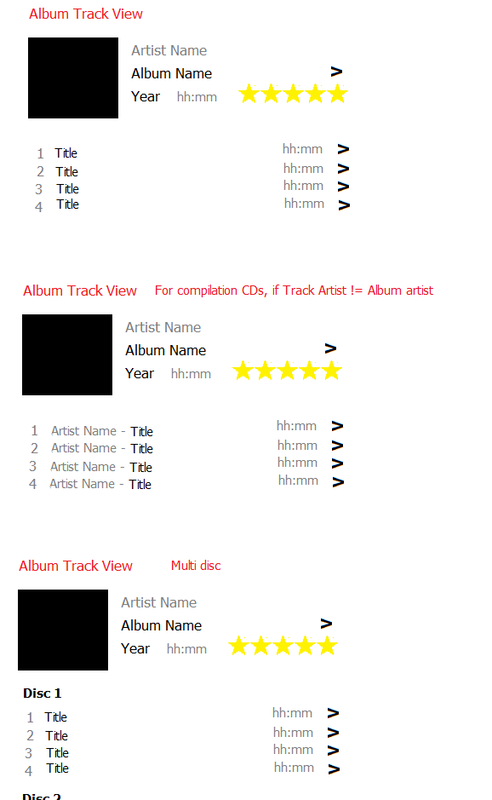 In the case above, at the same level you can let display the same content as track list, as list of albums and album artists. That is the usual way how windows phone apps work. The ui control is called pivot and panorama function. Personally I prefer to have the date precede the album name when browsing by artist > album or maybe have that option. I'm sure you guys will be able to find the happy medium between usability and customizability/functionality.